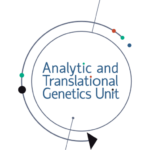 The Analytic and Translational Genetics Unit is a Unit within the Department of Medicine at MGH working in partnership with the Broad Institute of MIT and Harvard. Our overall mission is learning to interpret genome sequence data for both the discovery of the genetic underpinnings of human disease and for the development of paradigms by which individuals’ genome sequence can be effectively integrated into clinical decision making. The ATGU works closely with colleagues at a number of local institutions, both within Massachusetts General Hospital (in particular, the Center for Genomic Medicine and the Psychiatric and Neurodevelopmental Genetics Unit) and in the broader local scientific community. These include Broad Institute of Harvard and MIT, the Stanley Center for Psychiatric Research, Harvard Medical School.